MainAll NewsInside IsraelWhat if there aren't 61 MKs who prefer PM Netanyahu? Pres. Rivlin urges 'unity,' questions what will happen if PM Netanyahu doesn't secure support of majority. Israeli President Reuven Rivlin asked Tourism Minister Yariv Levin (Likud) what would happen if less than 61 Knesset members prefer Israeli Prime Minister Binyamin Netanyahu for the premiership. Sixty-one is the minimum majority required to form a coalition in Israel's 120-member Knesset. Following elections, Israel's president meets with Knesset members asking who they recommend for premiership. 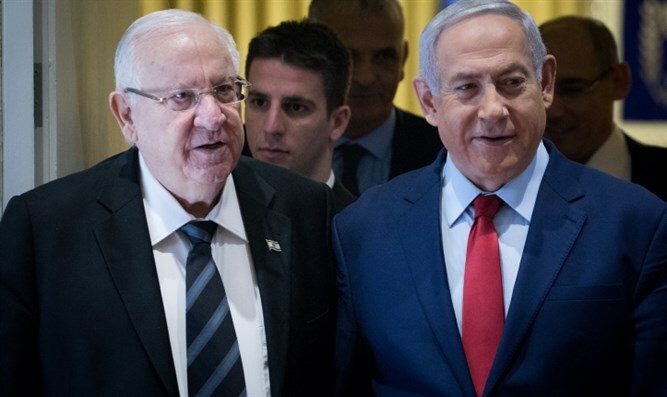 The meetings began Monday morning, and Netanyahu is expected to receive the most support, leading Rivlin to task him with forming the next government. "What happens if there aren't 61 Knesset members who recommend Netanyahu for premiership?" Rivlin asked Levin. "I'm asking theoretically." "If there aren't 61 who recommend him, we're still the largest party and have more people recommending [him], then Netanyahu still has the better chance," Levin replied. "I've heard your recommendation," Rivlin said. "I call you to unity, due to the challenges facing us, which are not simple." "We need to find the commonalities we share, despite the differences of opinion."